Cody Phillips Attorney Profile | Anthony Lombardo & Associates, Inc. - Anthony Lombardo & Associates, Inc.
Cody Phillips grew up in Paso Robles in a farming and winemaking family, working in the family vineyard and distillery. Upon his graduation from Mission Prep in San Luis Obispo, Cody attended UC Berkeley where he received a Bachelor of Arts in Middle Eastern Studies (2011). Cody then attended Tulane Law School in New Orleans, LA where he received his Juris Doctorate degree (2014) as well as certificates in environmental law and mediation. Between his second and third year of law school, Cody clerked for the California Attorney General’s office in Los Angeles in the Natural Resources Section, where he began honing his skills in legal research and writing, and California law. While attending Tulane, Cody studied questions of land use and environmental law in the field, in Havana, Cuba and Panama City, Panama. 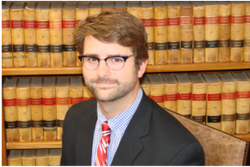 Cody also served as a managing editor of the Tulane Environmental Law Journal. Before returning to the Central Coast to practice, Cody worked in Sacramento at the Delta Stewardship Council, where he gained significant experience in CEQA, California water law and myriad other California land use laws. In his spare time, Cody distills spirits at his family’s winery and distillery, and enjoys watching his 49ers and Cal Golden Bears.